received audience from His Royal Highness the Prince Maestro Junsuke Borbone of Sicily. organized 23rd official meeting of New Royal Diplomacy between Italy and Japan. organized 22nd official meeting of New Royal Diplomacy between Italy and Japan. received audience from Their Excellencies the Honorable Sir Kazuo Yamagami and Lady Yoshiko Kado of Japan. attended the Banquet Concert of New Royal Diplomacy in Chania, Crete. organized 21st official meeting of New Royal Diplomacy between Italy and Japan. His Royal Highness the Prince Maestro Junsuke Borbone of Sicily before leaves St. Petersburg, Russia. organized 74th official meeting of New Royal Diplomacy between Italy and Russia. organized 73rd official meeting of New Royal Diplomacy between Italy and Russia. organized 25th official meeting of New Royal Diplomacy between Italy and Russia and Japan. organized 24th official meeting of New Royal Diplomacy between Italy and Russia and Japan. received official interview from Russian 78 Channel Television. received official interview from Russian 1st Channel Television. attended the Banquet Concert of New Royal Diplomacy between Italy and Russia in St. Petersburg, Russia. received official greetings from guests of the Banquet Concert of New Royal Diplomacy between Italy and Russia in St. Petersburg, Russia. organized 20th official meeting of New Royal Diplomacy between Italy and Japan. organized 23rd official meeting of New Royal Diplomacy between Italy and Russia and Japan. organized 72nd official meeting of New Royal Diplomacy between Italy and Russia. organized 71st official meeting of New Royal Diplomacy between Italy and Russia. His Royal Highness the Prince Maestro Junsuke Borbone of Sicily to St. Petersburg, Russia. organized 70th official meeting of New Royal Diplomacy between Italy and Russia. 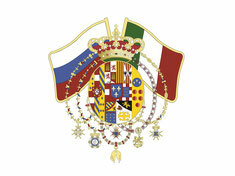 organized 69th official meeting of New Royal Diplomacy between Italy and Russia. received audience from His Excellency Mr. Igor Panarin of Russia. organized 68th official meeting of New Royal Diplomacy between Italy and Russia. His Royal Highness the Prince Maestro Junsuke Borbone of Sicily to Moscow, Russia. received official interview from NEA Crete Television. received audience from His Excellency Mr. Kostas Chrysanthos of Greece. They organized 5th official meeting of New Royal Diplomacy between Italy and Greece. welcomed His Royal Highness the Prince Maestro Junsuke Borbone of Sicily to Chania, Crete. organized 22nd official meeting of New Royal Diplomacy between Italy and Russia and Japan. organized 21st official meeting of New Royal Diplomacy between Italy and Russia and Japan. organized 20th official meeting of New Royal Diplomacy between Italy and Russia and Japan. organized 66th official meeting of New Royal Diplomacy between Italy and Russia. organized 19th official meeting of New Royal Diplomacy between Italy and Russia and Japan. signed document of New Royal Diplomacy between Italy - Russia - Japan. attended the Banquet Concert of New Royal Diplomacy between Italy - Russia - Japan in Tokyo, Japan. received official greetings from guests of the Banquet Concert of New Royal Diplomacy between Italy - Russia - Japan in Tokyo, Japan. organized 18th official meeting of New Royal Diplomacy between Italy and Russia and Japan. organized 17th official meeting of New Royal Diplomacy between Italy and Russia and Japan. Their Excellencies the Honorable Kazuo Yamagami and Lady Yoshiko Kado of Japan. organized 16th official meeting of New Royal Diplomacy between Italy and Russia and Japan. organized 65th official meeting of New Royal Diplomacy between Italy and Russia. They received audience from Their Excellencies the Honorable Sir Kazuo Yamagami and Lady Yoshiko Kado of Japan. organized 64th official meeting of New Royal Diplomacy between Italy and Russia. received audience from His Excellency the Honorable Lord Vladimir Sushkov of Ukraine. They organized 6th official meeting of New Royal Diplomacy between Italy and Ukraine. received audience from Their Excellencies Mr. Igor Panarin and Mr. Sergey Dvoryanov of Russia. organized 63rd official meeting of New Royal Diplomacy between Italy and Russia. welcomed His Royal Highness the Prince Maestro Junsuke Borbone of Sicily to Moscow, Russia.